ThermLink supplies premium hydronic equipment that is perfectly matched with the heat source - whether it be geothermal, gas boiler, or electric boiler. From Pex-A tubing to pumps, valves, manifolds, etc. to advanced controls, ThermLink has the right combination to match your project. Plus, allow ThermLink to design your system to ensure everything works together seamlessly. ThermLink has chosen premium Pex-A tubing from HeatLink. Pex-A tubing is considered the best tubing because it has the highest degree of "crosslinking" which provides a more uniform product with no weak links. Plus, it incorporates an Oxygen Barrier to keep any air from entering the heating system. 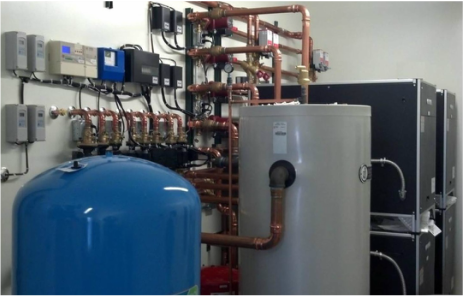 The beauty of hydronic systems is that they allow for endless design possibilities including zoning, domestic hot water, spa and pool heating, snowmelt, etc. To handle these applications ThermLink uses advanced controls from Tekmar and HBX.